A Superb Detached Split Level Bungalow in a Highly Regarded Area. Enjoying Fabulous Sea Views Across to Douglas Head from a Large Balcony. Easy Access to the Facilities and Amenities of Both Onchan & Douglas. Offered in Immaculate Condition Throughout with Excellent Storage Facilities. Flexible Accommodation with a Spacious Reception Hall & Cloakroom WC. Stylish Breakfast Kitchen & Generous Lounge with Dining Room & Balcony Off. Re Fitted Family Bathroom, Study/Bedroom 4 and 2 Further Double Bedrooms. Master Bedroom with Fitted Wardrobes, Dressing Area & Superb E/S Bathroom. 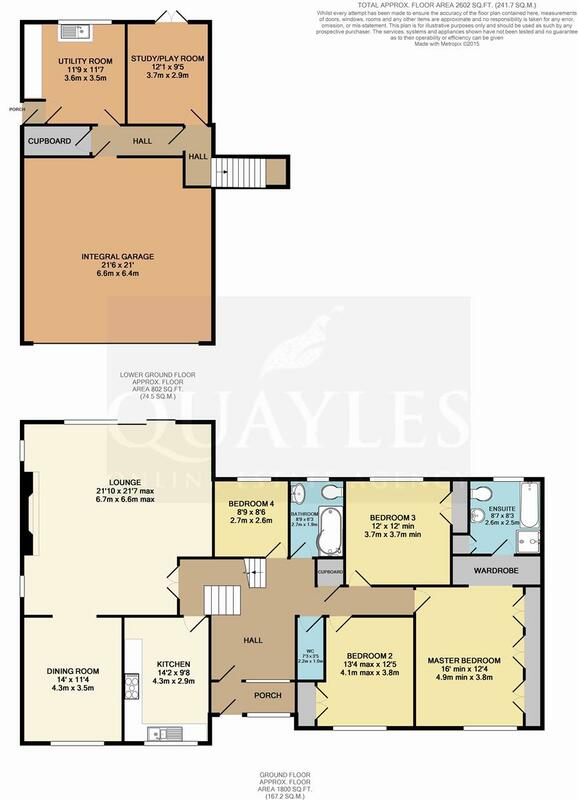 Lower Ground Floor: Study/Playroom, Large Utility Room & Walk In Store. Gas Fired Central Heating & uPVC Double Glazing, Fascias & Soffits. Integral Double Garage & Off Road Parking for 2-3 Vehicles. Open Plan Frontage with a Raised Patio Offering Sea Views. Completely Landscaped, Enclosed Rear Garden with Lawn & Patio Area. Travel along Douglas Promenade in a northerly direction, passing the Gaiety Theatre and the Villa Marina. Continue along past the old Summerland site and the entrance to Port Jack with its shop, Post Office, hairdressers and food outlets. Continue along King Edward Road, and take a left over the tramlines onto Howe Road. Follow the road up and around then take the next left into Links View where the property will be observed a short distance up on the left hand side of the road. The main entrance is approached via a front patio with contemporary glass and chrome ballustrades which offers fabulous sea views. Part obscure glazed uPVC entrance door and matching side panel to the porch. Coved ceiling. Night light. Tiled floor. Glazed multi pane doors to the reception area. A spacious area with a coved ceiling and four steps up to the main living space. Stairs lead down to the lower ground floor. Power points. Loft access. Airing cupboard with slatted shelving housing the hot water cylinder with fitted emersion heater. Doors to the cloakroom, family bathroom, study and bedrooms. A small landing with multipane glazed doors to the kitchen and lounge. A light and airy room fitted with a range of ivory coloured wall, base and drawer units together with oak block effect work surfaces incorporating a 1 1/4 bowl stainless steel sink with a lever mixer tap. Corner carousel unit. Space for a dishwasher and large fridge freezer. 'Britannia' stainless steel range style cooker with a fire burner halogen hob, 1 1/2 electric ovens, stainless steel splash back and an AEG extractor. Counter lighting. Stainless steel and glass shelves. Tiled upstands. A uPVC window to the front offers partial sea views. Modern vertical radiator. Ceiling spot light fittings. Space for a breakfast table and chairs. Quality wooden flooring. 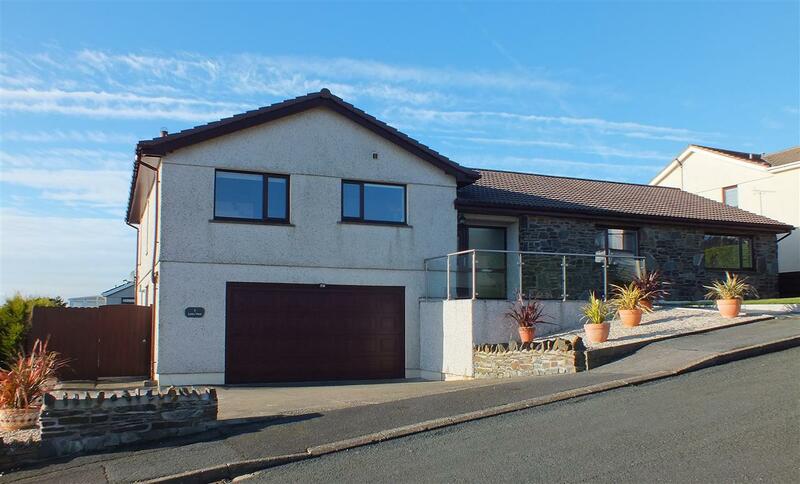 An exceptionally light and spacious, dual aspect room with twin windows to the side and large sliding patio doors to the rear enjoying fabulous sea views across Onchan to Douglas head and giving access to the balcony. Open grate fireplace with a marble surround and hearth. Television and satellite points. Coved ceiling. Dimmer lighting control. Smoke detector. Clear opening to the dining room. A good size room with a uPVC window to the front elevation. Dimmer lighting control. Coved ceiling. A generous single room which is currently utilised as a study with a uPVC window to the rear enjoying partial sea views. Coved ceiling. Telephone point. Fully tiled in neutral tones with a matching floor. Fitted with a contemporary white suite comprising push button flush WC, large P shaped bath with a glazed screen and 'Triton' electric shower over together with a large vanity unit with a top mounted basin, incorporating drawers and cupboard space. Illuminated mirror with overhead lighting. Large heated ladder style towel warmer. Obscure glazed uPVC window. Ceiling spotlight fitting. A good size double room with a deep, recessed, built in wardrobe. Ample space for a Queen size bed and bedside units. Enjoying pleasant sea views over the garden via a uPVC double glazed window. Coved ceiling . A superb room which has an array of built in furniture comprising three recessed double wardrobes, three drawer units and two small dressing table niches with drawers and illuminated mirrors. Ample space for a 'Super King' size bed. Having a uPVC window to the front elevation. TV point. Coved ceiling and centre light on a dimmer control. Door to the bathroom. Tiled to mid height in neutral tones with complementary floor tiles. Step in, tiled enclosure with a fully plumbed shower, combined light/extractor and a glazed door. Fitted with a stylish white 'Gala' suite comprising panelled bath, push button flush WC and a large pedestal basin with an illuminated mirror above and shaver point. Recessed, shelved linen cupboard. Obscure glazed uPVC window to the rear. Heated ladder style towel warmer. Coved ceiling with spot light fitting. A spacious room which could easily accommodate a 'Super King' or twin beds. Having a uPVC window to the front elevation and recessed double wardrobe. Coved ceiling. Fitted with a contemporary white suite of push button flush WC and hand basin on a tiled pedestal. Coved ceiling. Ceramic tiled floor. Coat Hooks. Smoke detector. Coved ceiling. Doors to the study/playroom and rear hall. A double sized room which is currently utilised as a home office with uPVC doors leading out to the rear patio. Ideal playroom or occasional bedroom. Wooden flooring. Coved ceiling. Telephone points. Coved ceiling. Oak effect, laminate floor covering which extends to the utility and store room. A large room fitted with a range of wall and base units with laminate work surfaces together with a stainless steel sink unit. Plumbed for washing machine. Double glazed uPVC window overlooking the rear garden. Coved ceiling. Half glazed wooden door to the side porch with a half obscure glazed door which leads to the side of the property..
A useful space which houses the gas metre. Light. Power points. Central heating controls. Having an electronically operated up and over door (fitted 2014) along with a 'Glowworm' gas fired boiler. Double glazed uPVC window to the side. Built in cupboards and shelves. Space for freezer and tumble dryer. Electric meter and consumer unit. Fluorescent strip lights. Open plan lawn and easy care stone chipped areas. Pathways with wooden gates lead to the rear garden. A concrete driveway provides off road parking for 2-3 cars. The entire rear garden has been landscaped by the current owners and benefits from easy care pathways, a large patio, two tiered lawn with central steps. Secure fenced and hedged boundaries. Enjoying pleasant views and a good degree of sunlight, the garden is both low maintenance and secure. Cold water point and power points. All mains services are installed. Gas fired central heating. Boiler replaced 2015.